Business Card Slitter – Full Bleed, High Speed, Heavy Duty, Professional, Automatic, Electric Business Card Slitter ERSO 1030FB. between each of the cards and accommodates four different stock sizes with minimum time for change of stock. The principle of business card slitter ERSO 1030FB operation. Business Card Slitter Full Bleed 1020FB allows you to produce to produce 10 full color business cards ( from stock 8.5″ x 11″), 20 full color business cards (from stock 11″ x 17″,12″ x 18″) and 30 full color business cards (from stock 13″ x 19″) per sheet with a simple two-pass operation and a short time to reset guides. First pass cuts a sheet into 3.5″ strips with a 0.125″ (1/8″) gutter between the strips, and then second pass cross cuts these strips down to finished 2″ x 3.5″ cards with a 0.125″ (1/8″) gutter between the cards. Resetting guides to accommodate different stock size can be done in 1 minute and more precise than automatic adjustment. The infeed stack allows keeping up to 70 pages and cutting at a speed of up to 600 business cards per minute. Adjustable infeed system allows you to accommodate different types of material thickness . Updated (significantly) reliable bottom friction feed which catches any types of paper ( triple infeed roll) – mate,glossy, UV coated ,etc. Precisely made Solid Steel Frame. Tolerance for finished business card size is ±0.005″. No curve cards. Clean cut. This slitter’s powerful motor allows you to cut hard card stock rapidly and precisely. We guaranty 5 +Years post warranty service + we will supply you any parts of slitter you need. Video demonstration of Business Card Slitter. 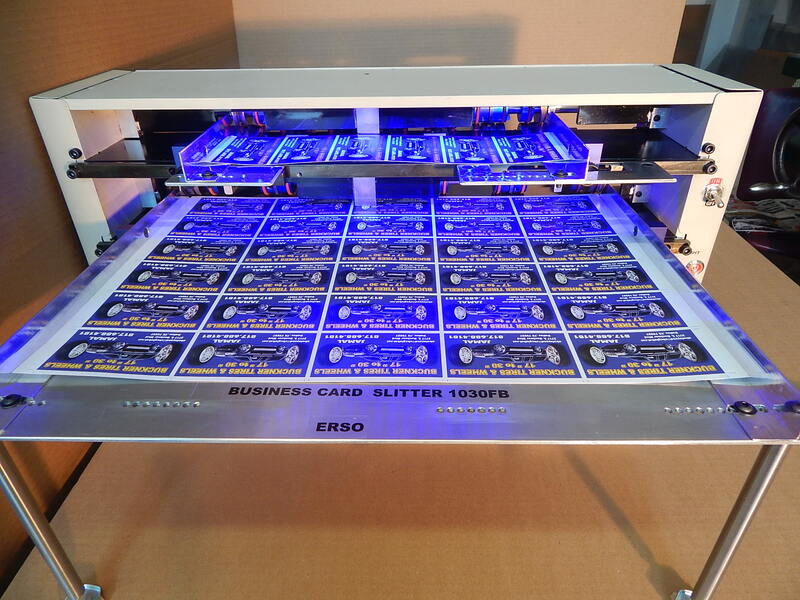 ERSO Business Card Slitter 1030FB – one slitter for four sizes of stock.